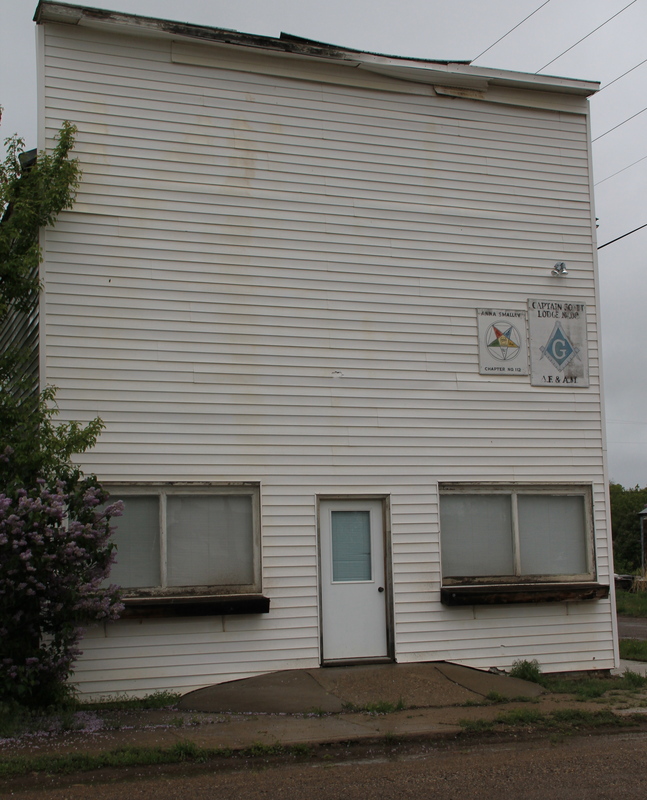 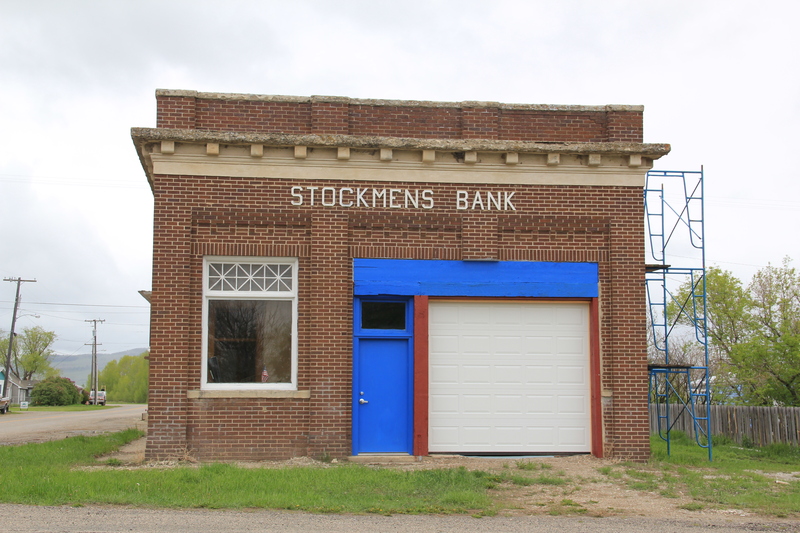 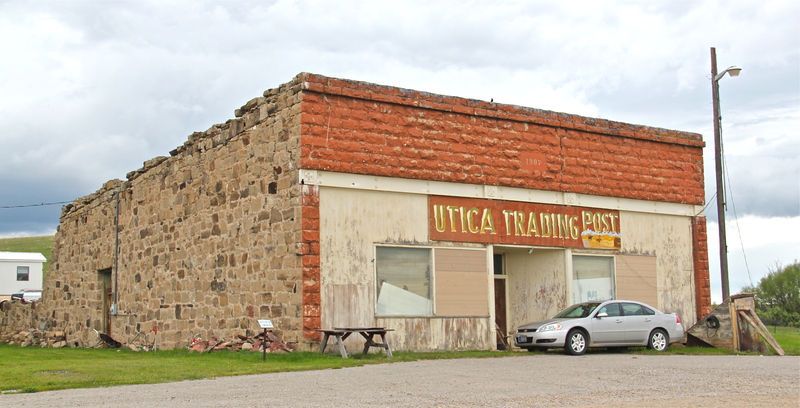 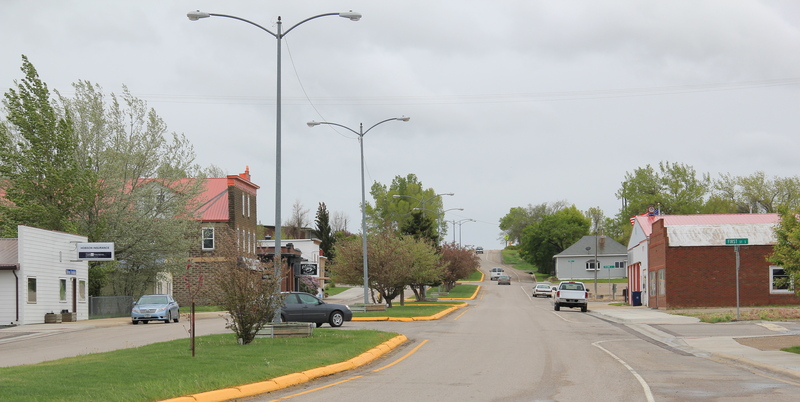 Rosebud, Montana, is a small Northern Pacific era railroad town in Rosebud County. 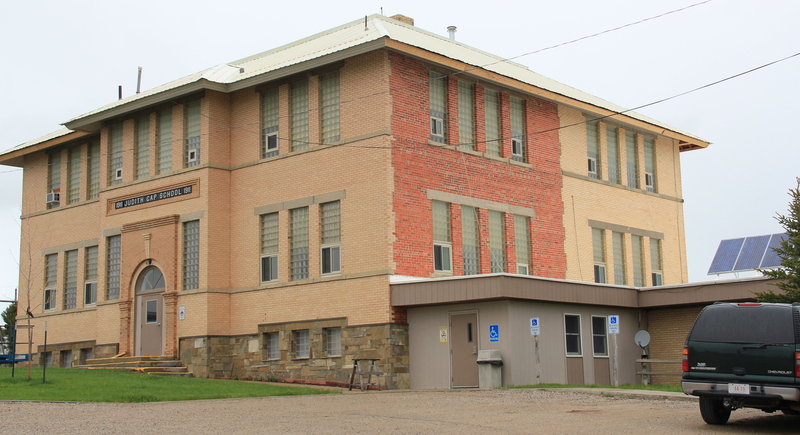 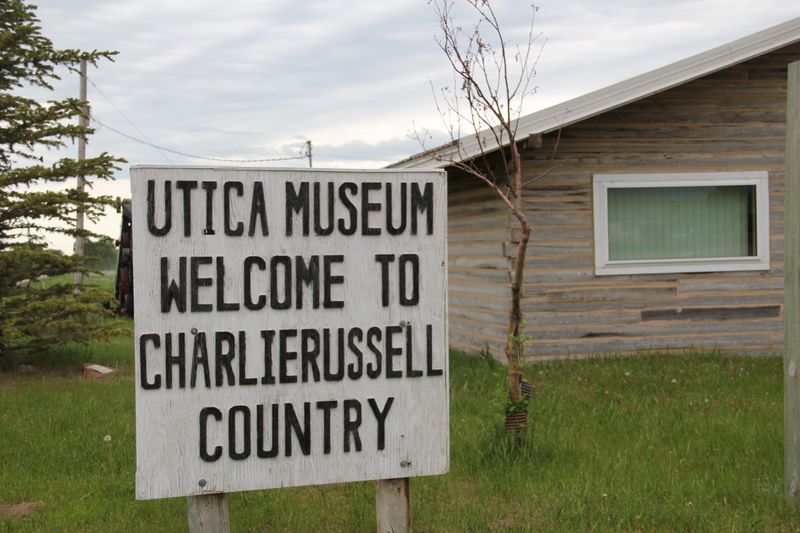 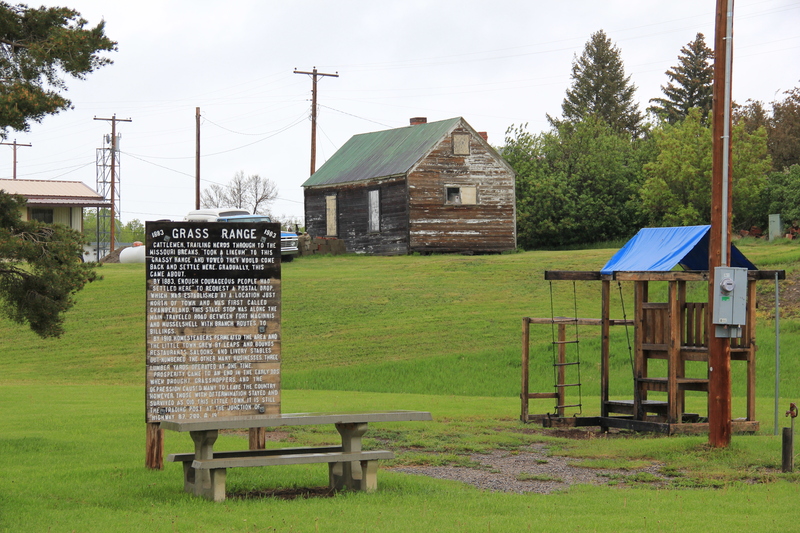 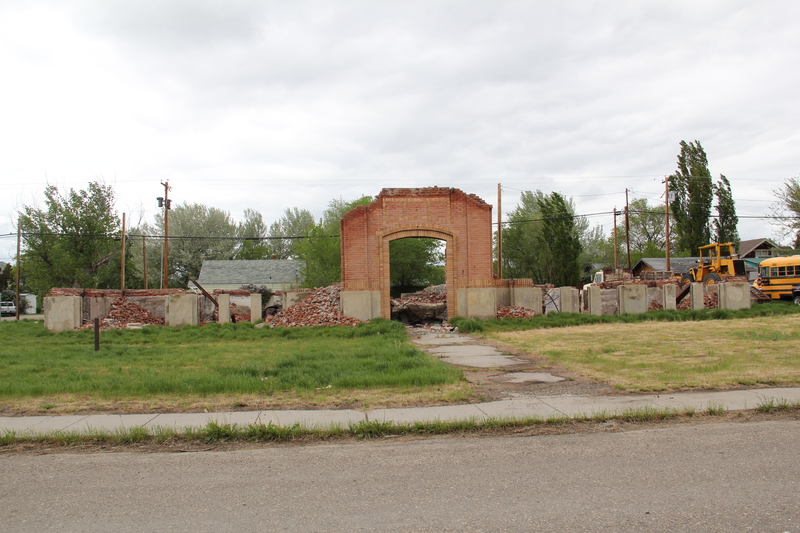 A recent commentator on the blog asked for more about this town, admitting that a real loss had been a fire that destroyed its historic school from the turn of the 20th century. 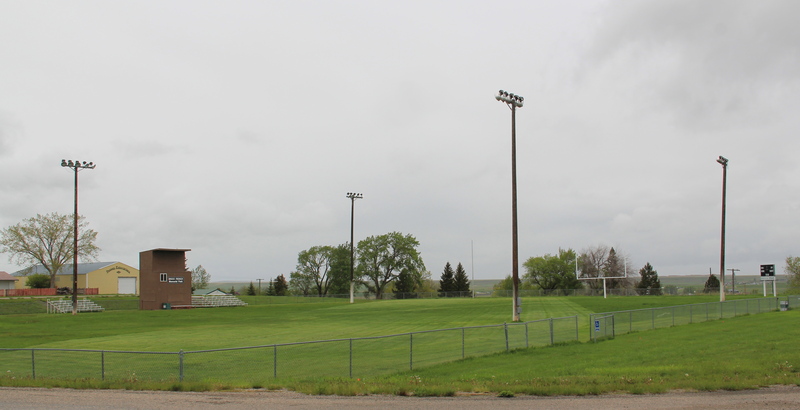 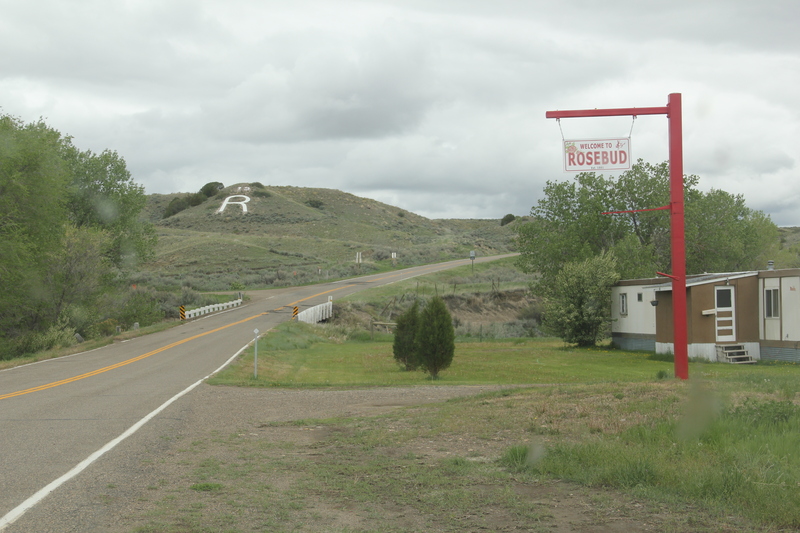 But Rosebud has rebuilt a modern school and like any credible Montana town, students maintain a “R” for the school on a bluff outside of town, and when the football season starts this month, this tiny field will be full of spectators, family, and players. 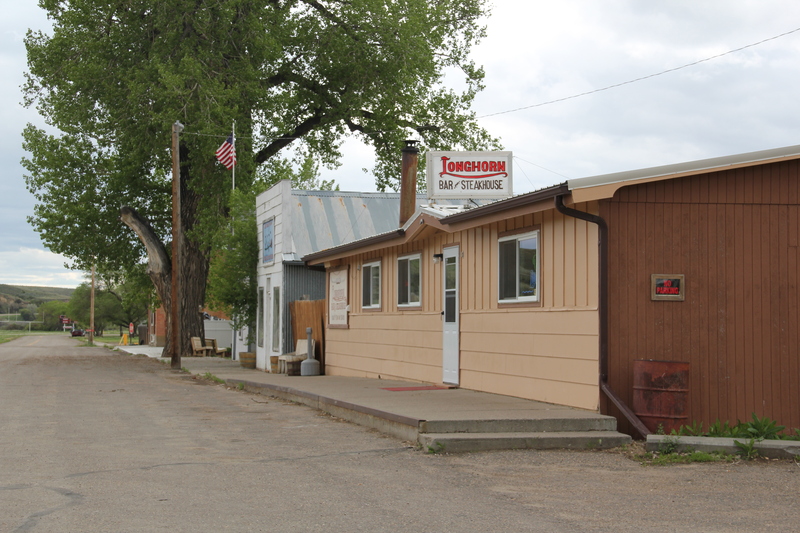 One reason I liked Rosebud back in 1984-1985 was the town bar, which had great food. 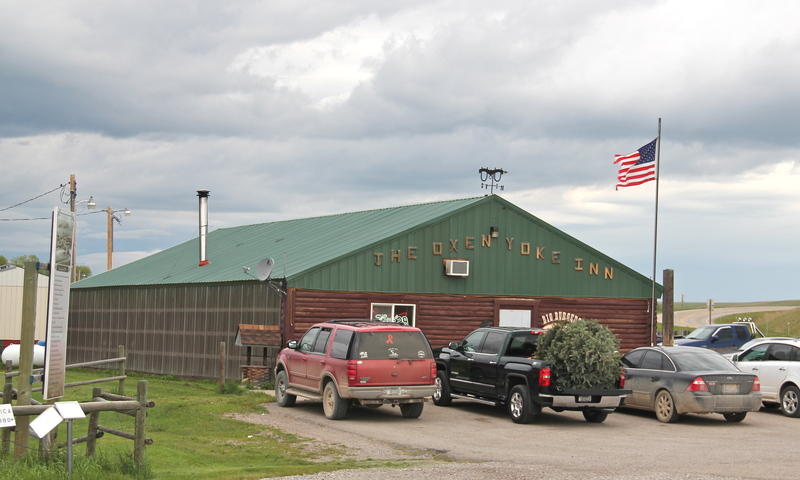 I didn’t remember it as the Longhorn Bar, but that’s the name today and the place still is friendly and worth a stop along old U.S. Highway 10. 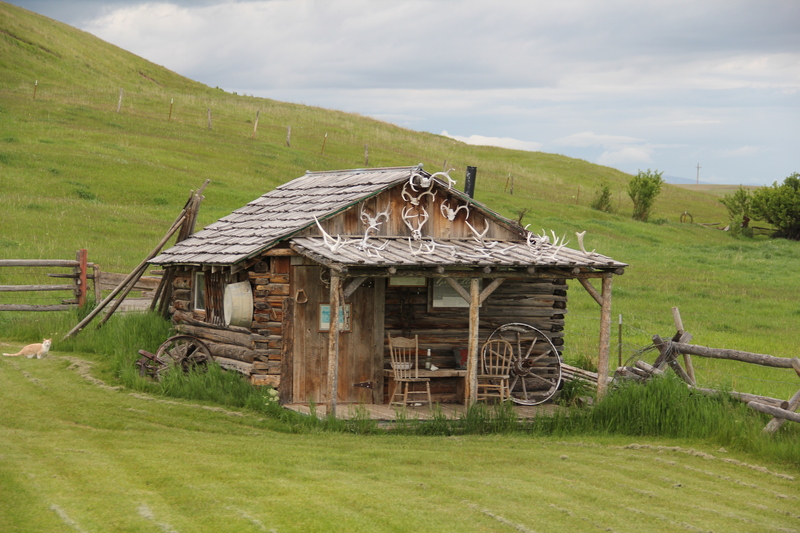 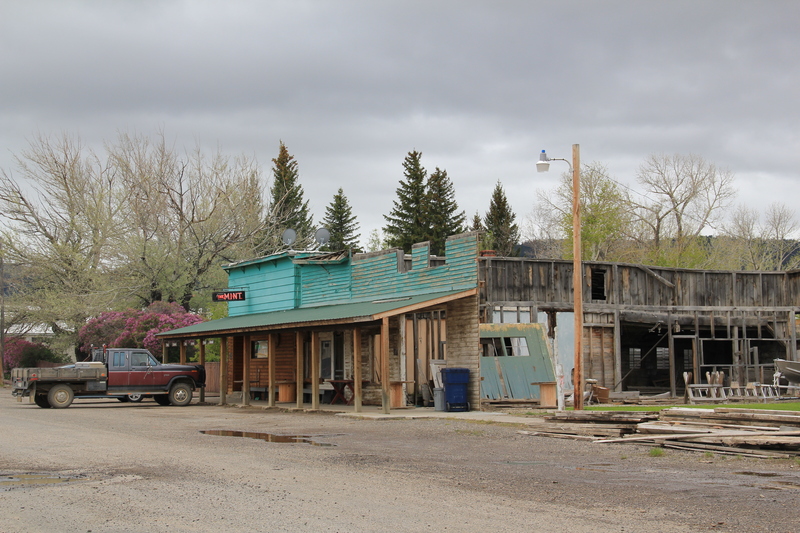 Another blog reader reminded me that it has always been known as the Longhorn Bar–so that shows you what you can forget in 30 years plus of Montana field study. 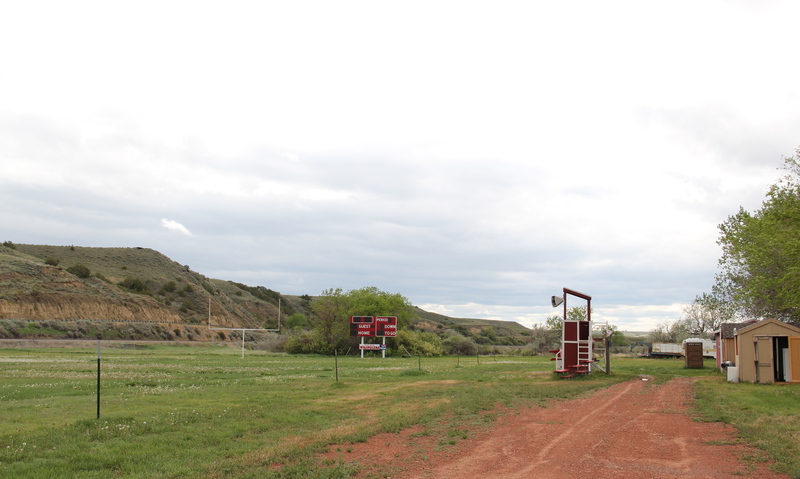 Note also in this photo–at the far right in the background is the football field goal posts, a visual of how small the place is. 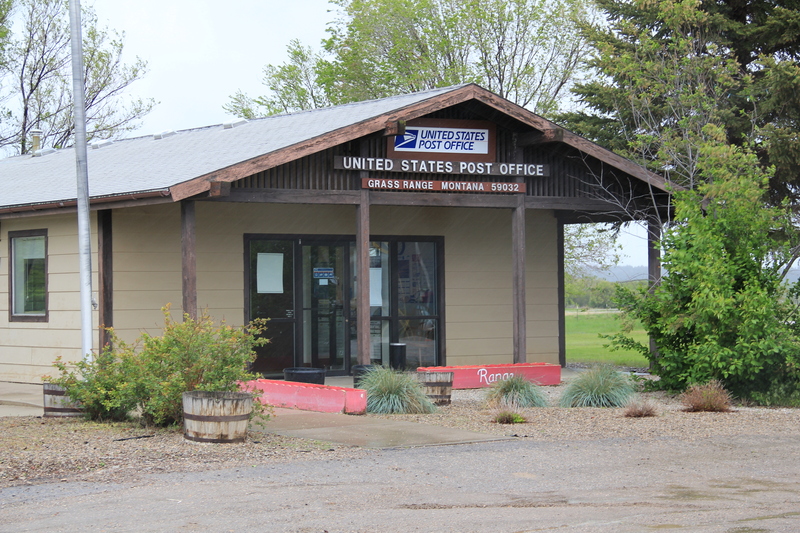 Rosebud was never a major railroad town in this part of the Yellowstone Valley but it has kept its school, a handful of businesses, and its post office, which had been updated since my last visit here. 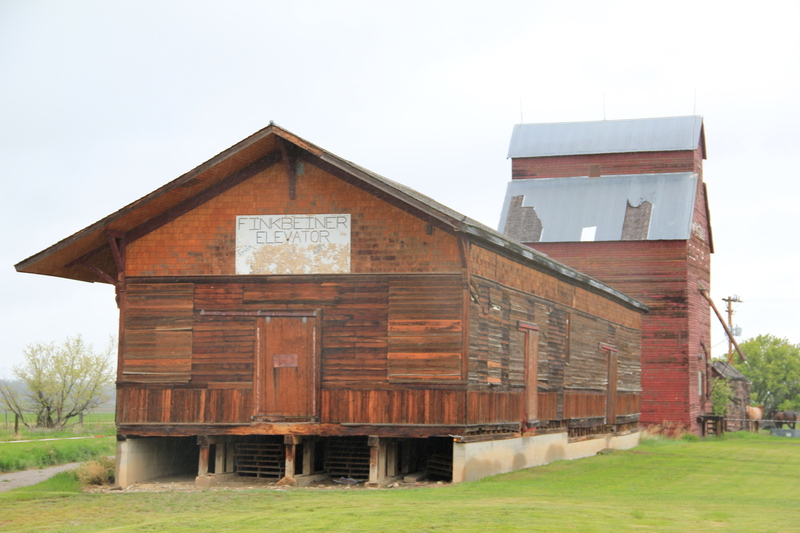 It’s still an important part of the valley’s historic landscape. 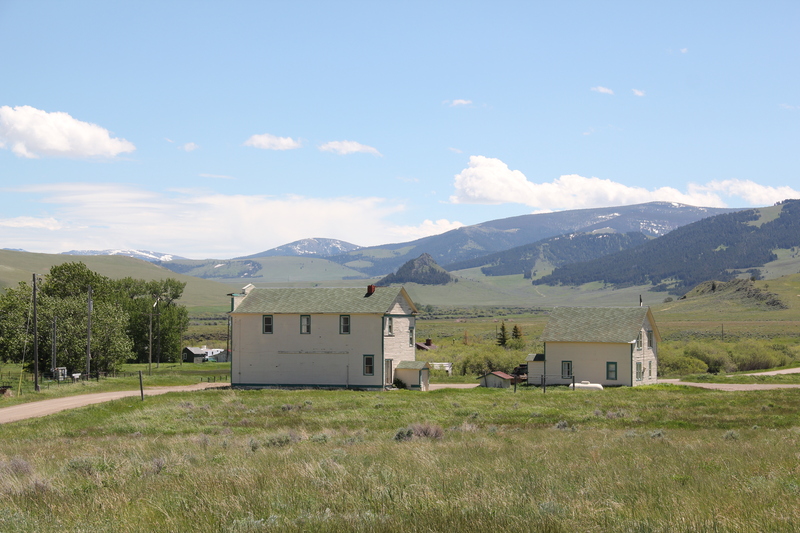 And an important intact 1920s section of the Yellowstone Trail–the initial transcontinental highway that followed the Milwaukee Road’s tracks into eastern Montana. 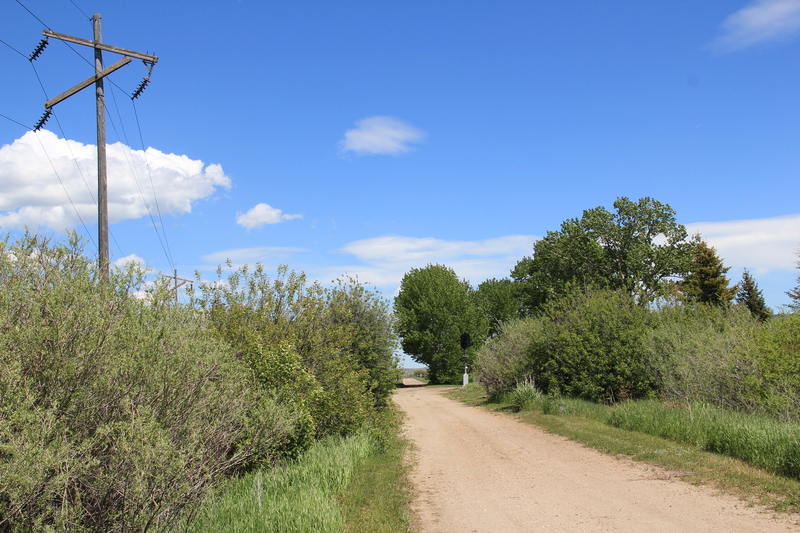 Montana State 294 is one of my favorite highways. 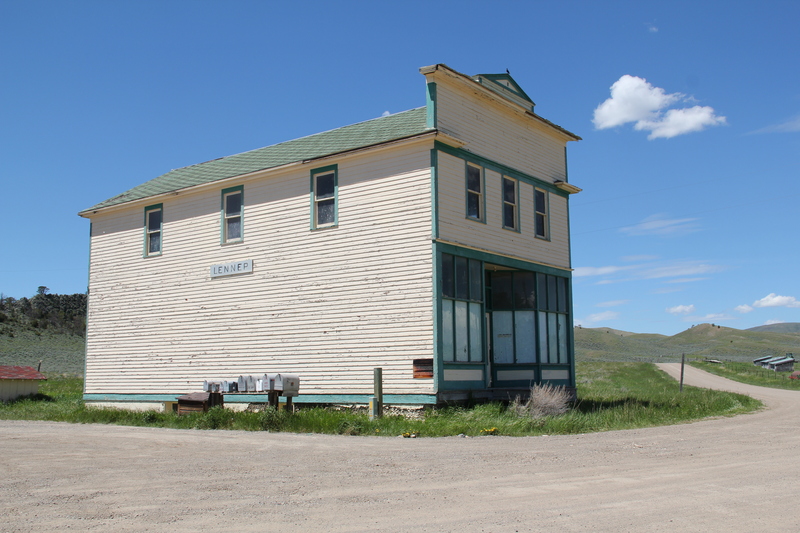 For Montana it is a short route, just around 30 miles between Martinsdale and where the road junctions with US 89 and meets up with Ringling. 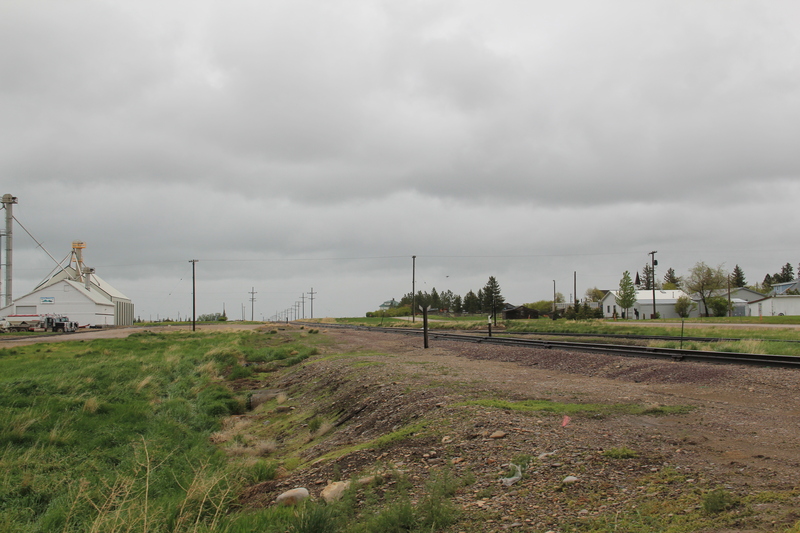 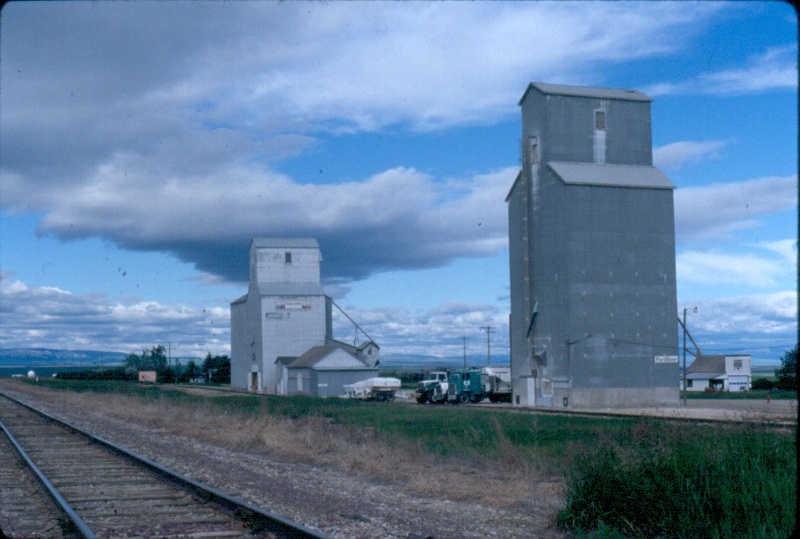 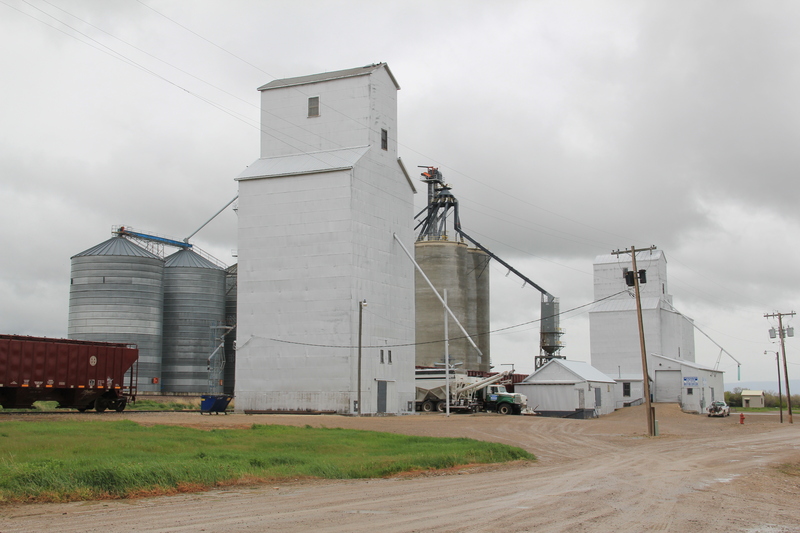 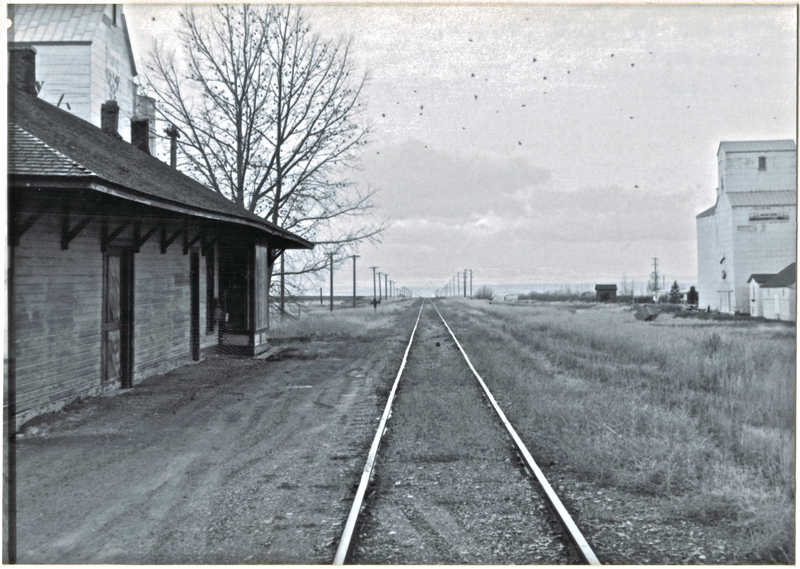 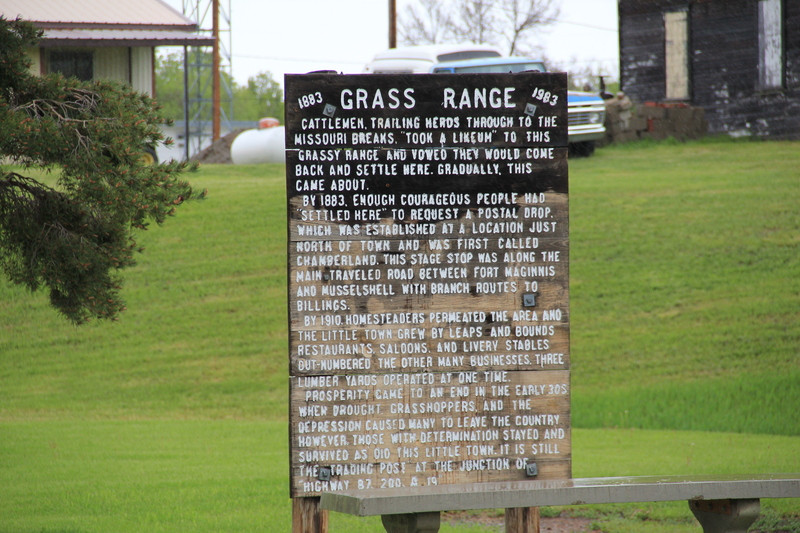 But these 30 miles are packed–well in a Montana sense–with resources of the original mainline of the Chicago, Milwaukee, St. Paul, and Pacific Railroad (the Milwaukee Road) as an electric line, such as the roadbed that parallels the state highway above at Lennep–it now serves as a secondary dirt road for residents. 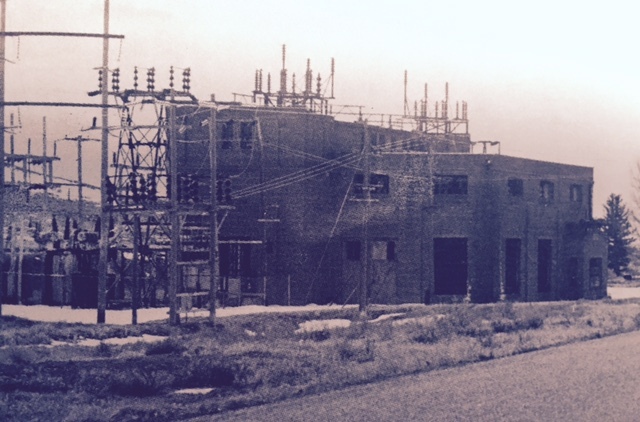 The Milwaukee maintained transformer stations about every 30 miles of its electrified tracks so AC power could be converted into DC current for its trains. 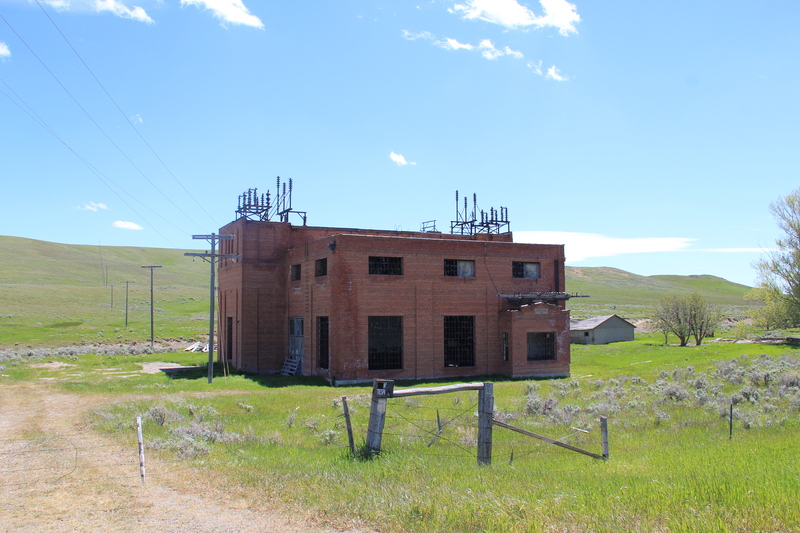 I apologize for the poor quality of my 1984 image of the station along Montana 294 but then it was still generating power for local use. 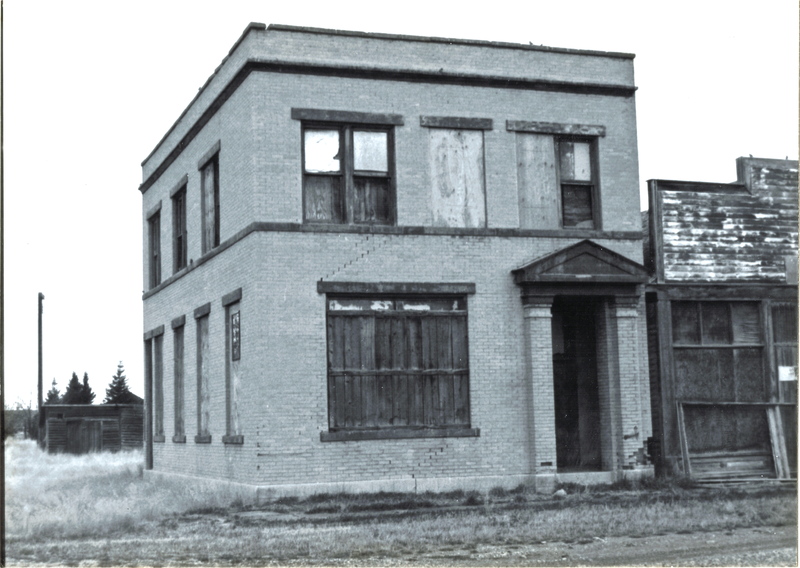 Thirty years later that had ended–the power lines were gone, taking away context from the building itself and leaving those who don’t know any better wondering why a big two story brick building was out here by itself. 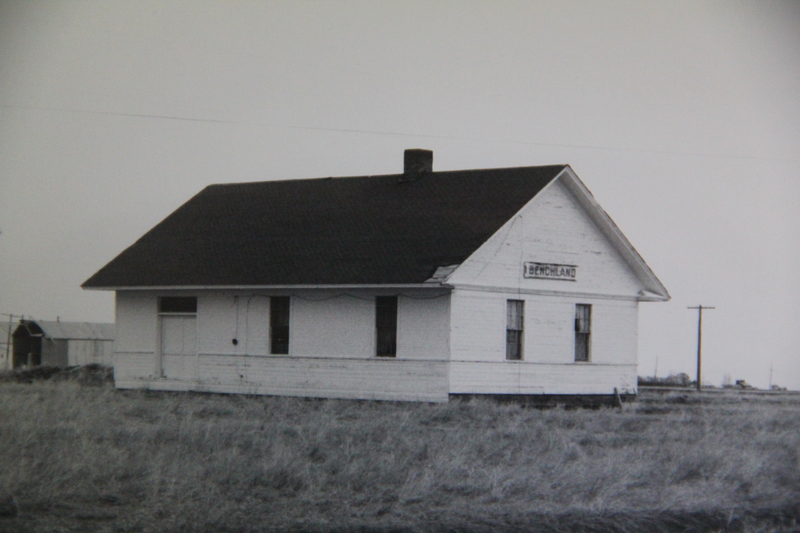 The school is now a residence and the store is still there, though not in business. 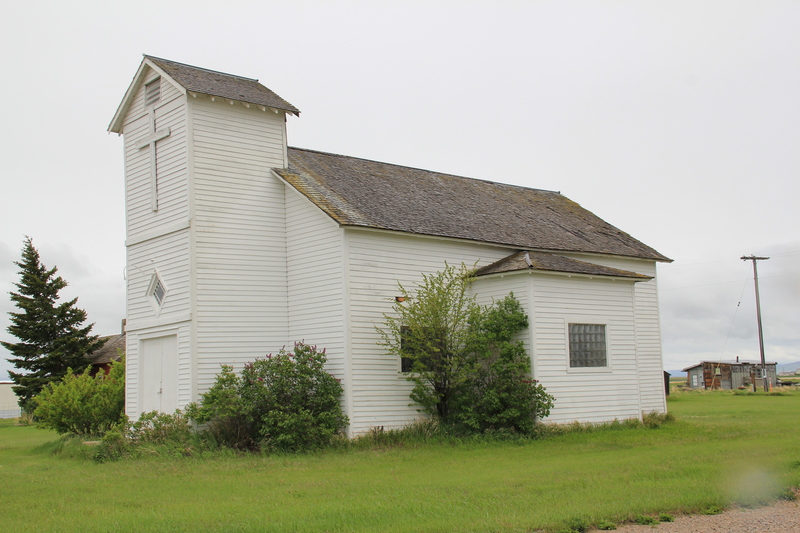 The true landmark of the entire road is the Trinity Lutheran Church, built in 1910. 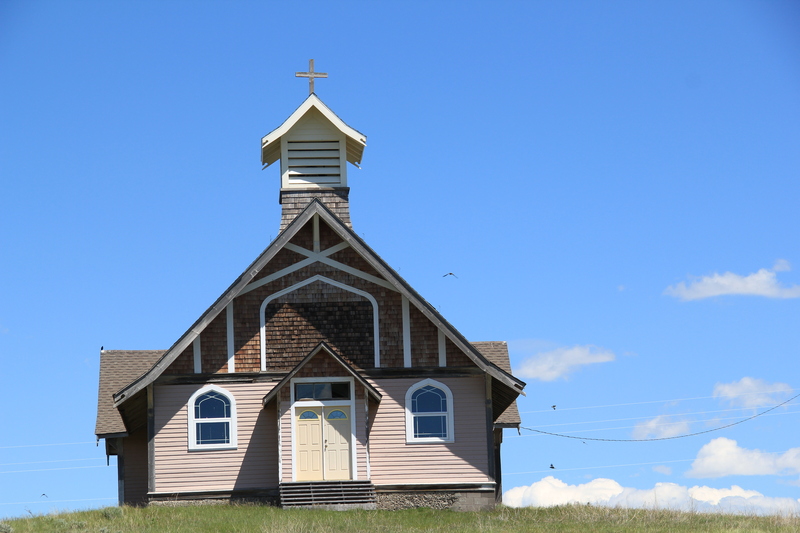 Its soaring Gothic bell tower, gleaming bright in the sun, is a beacon for anyone traveling along the road. 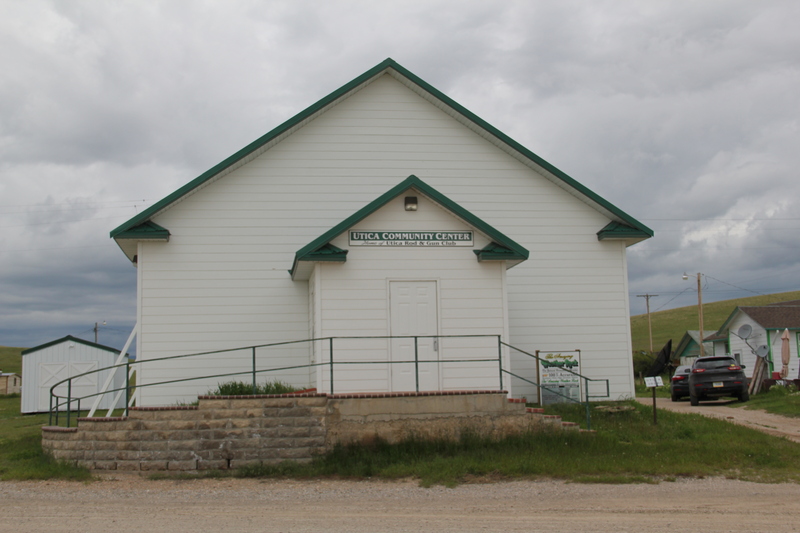 It is one of my absolute favorite rural Montana churches and clearly eligible for listing in the National Register–as would be the entire remaining hamlet of Lennep. 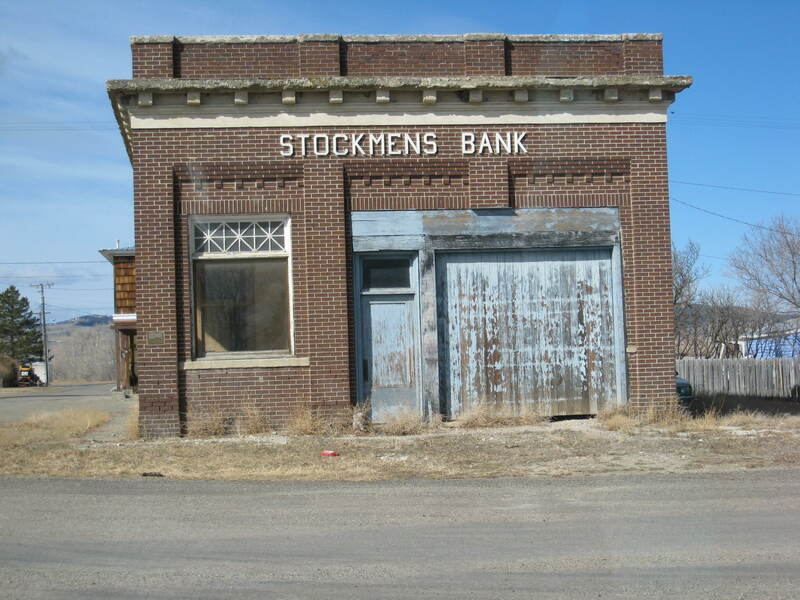 volumes of how the Milwaukee reshaped this landscape in the first decade of the twentieth century. 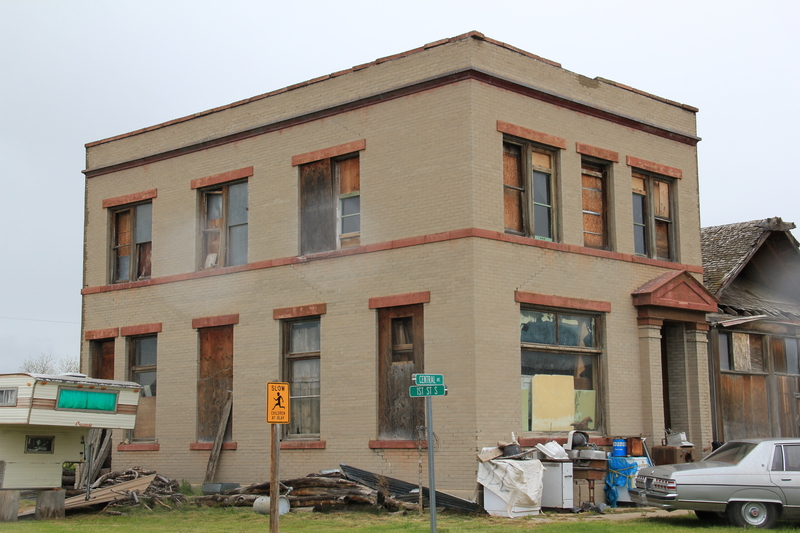 But since this image from 2013 I have learned that the depot is gone–part of the roof decking was missing then so I am not surprised at the lost. 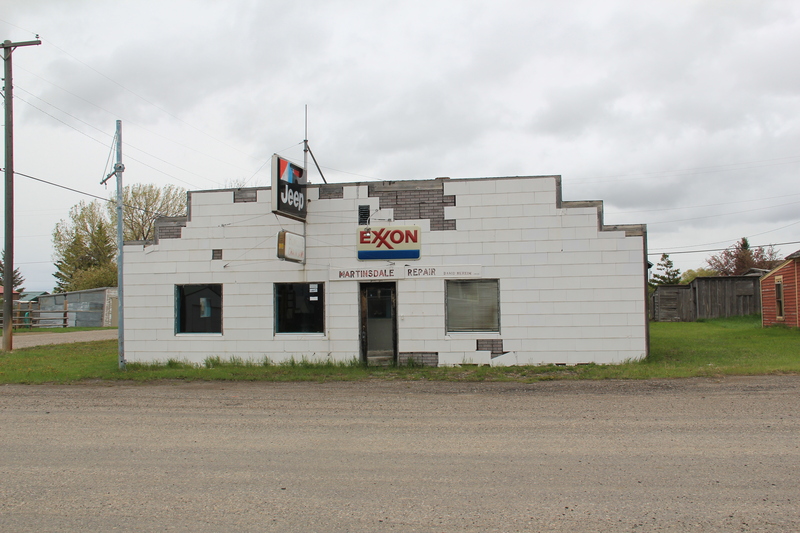 Just disappointed in the lack of vision of keeping this heritage asset together for the future. 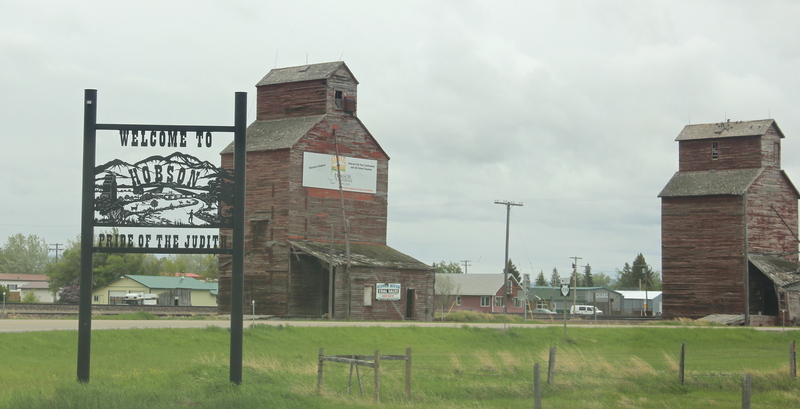 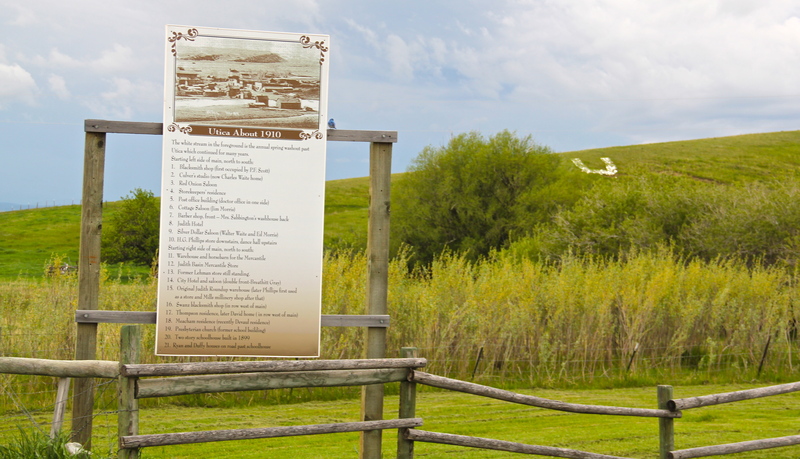 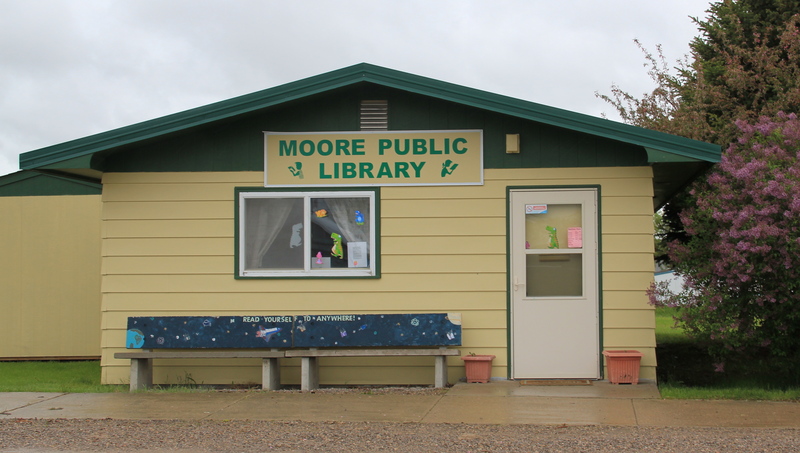 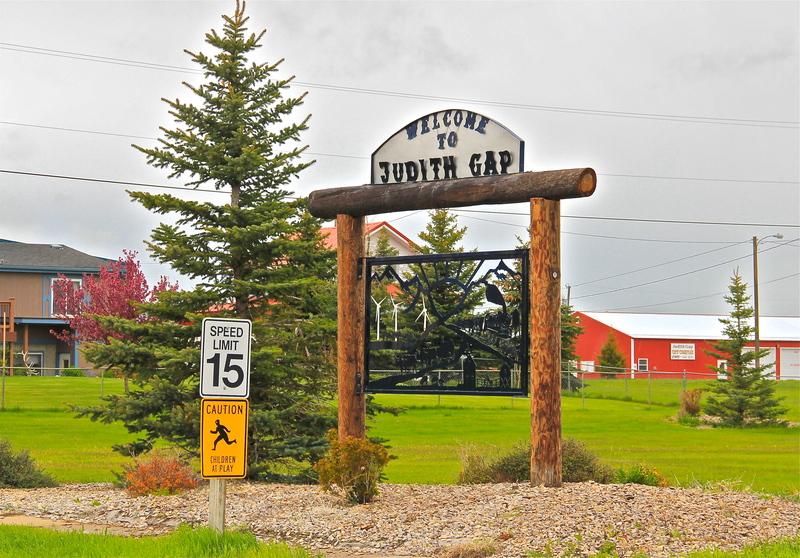 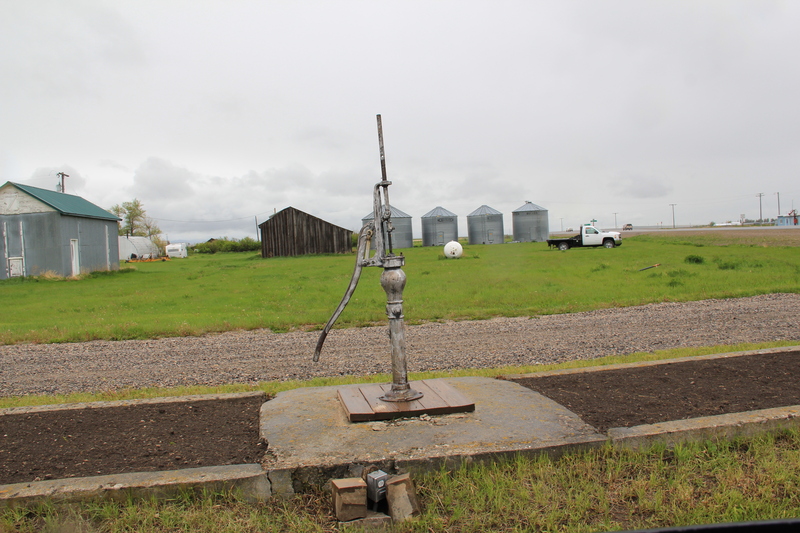 a landmark in Martinsdale. 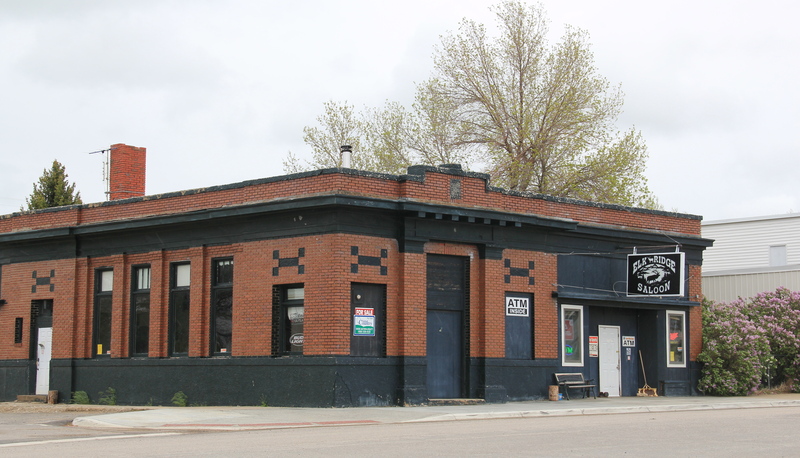 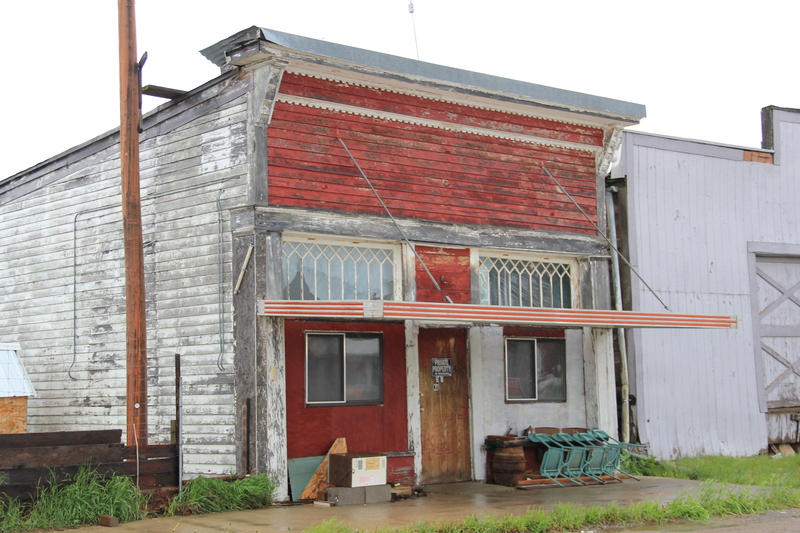 Can’t way to see its condition in 2015 because the town has several key buildings, and I just don’t mean the Mint Bar. 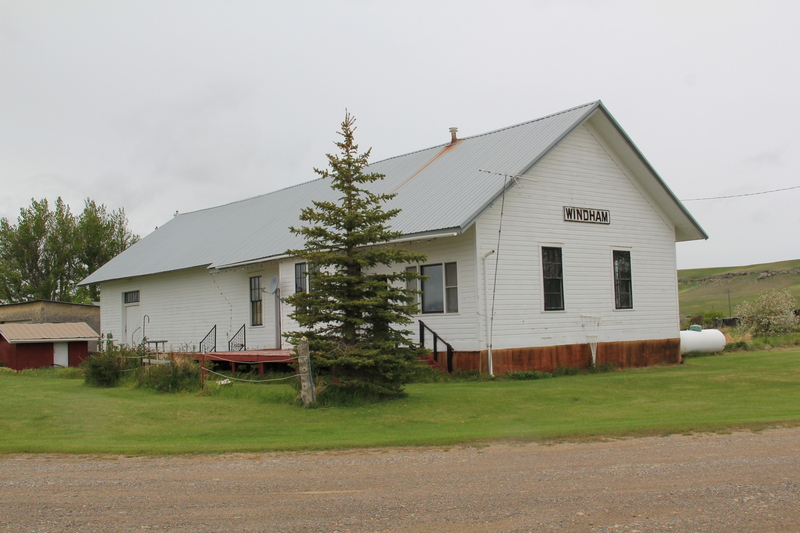 I really mean the Martinsdale Community Center. 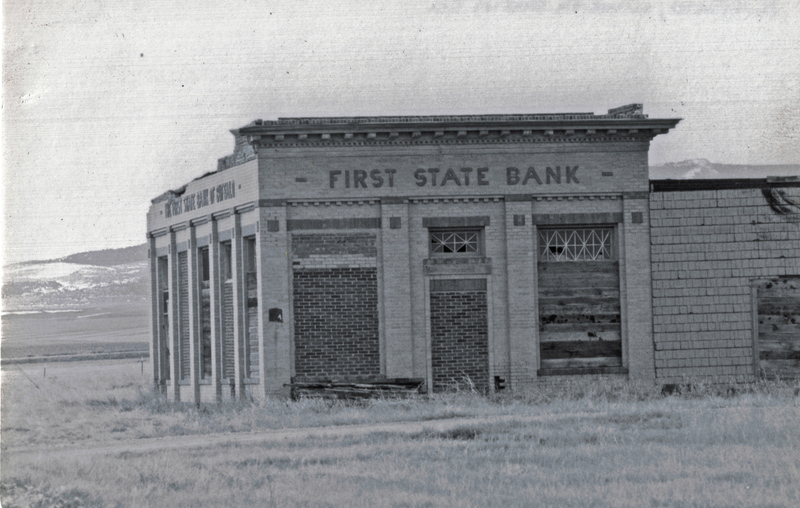 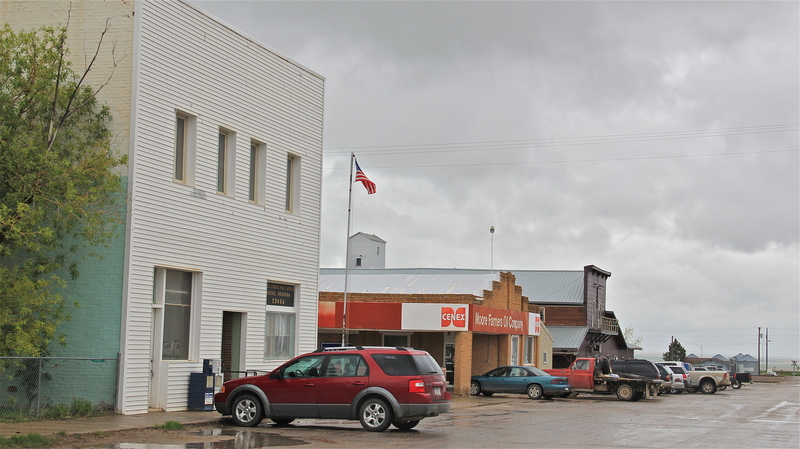 Rural reformers in the early 20th century pushed western communities to establish centers–where people could gather in a secular public space, vital for not only individual sanity but community togetherness in the dispersed population of the northern plains. 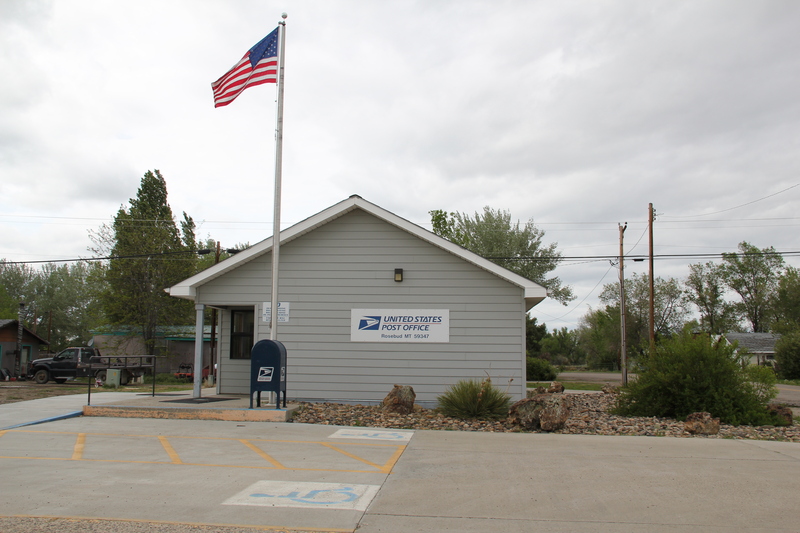 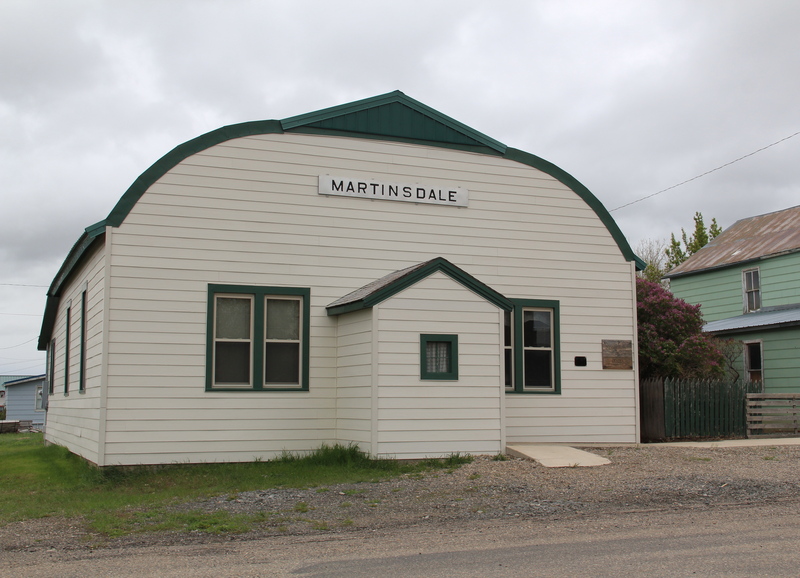 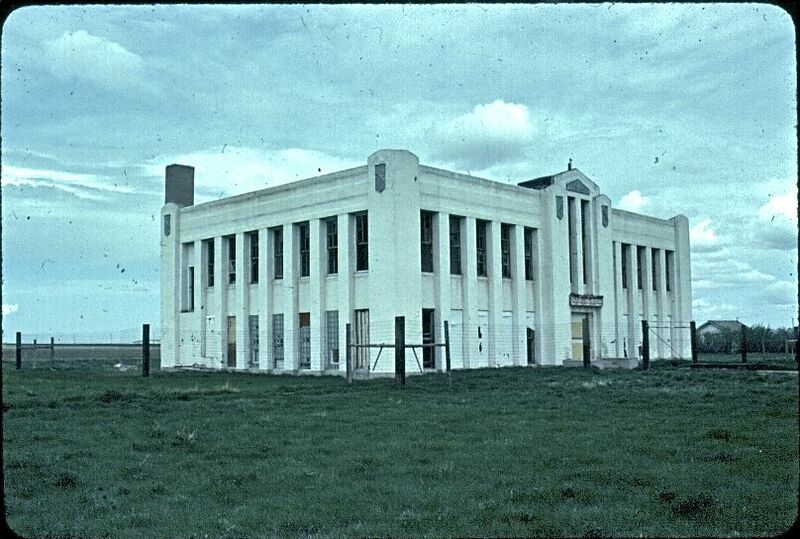 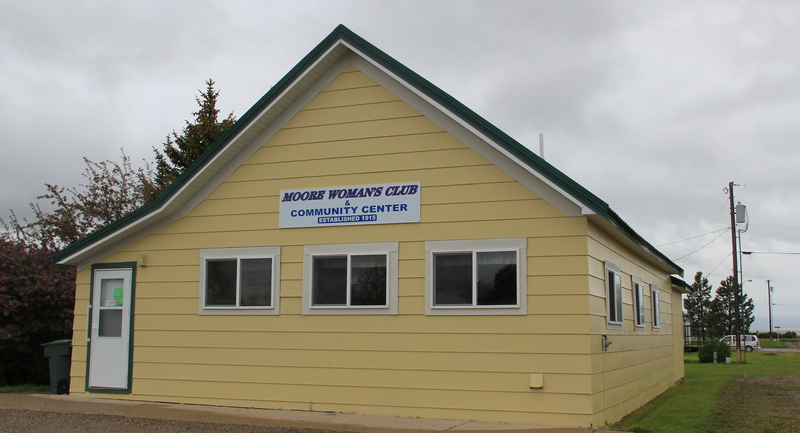 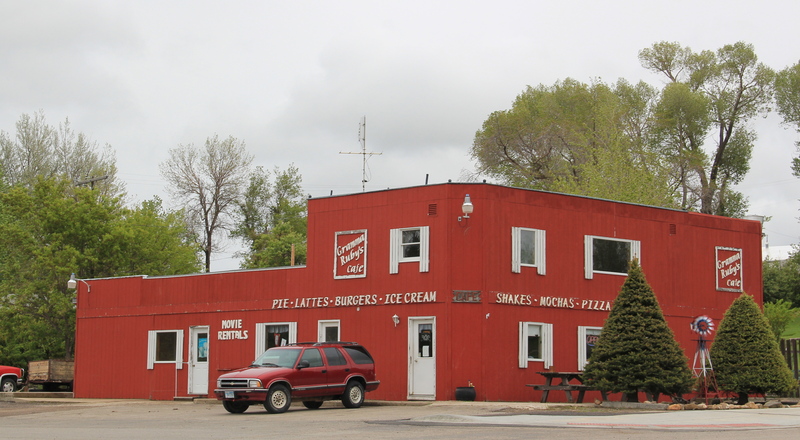 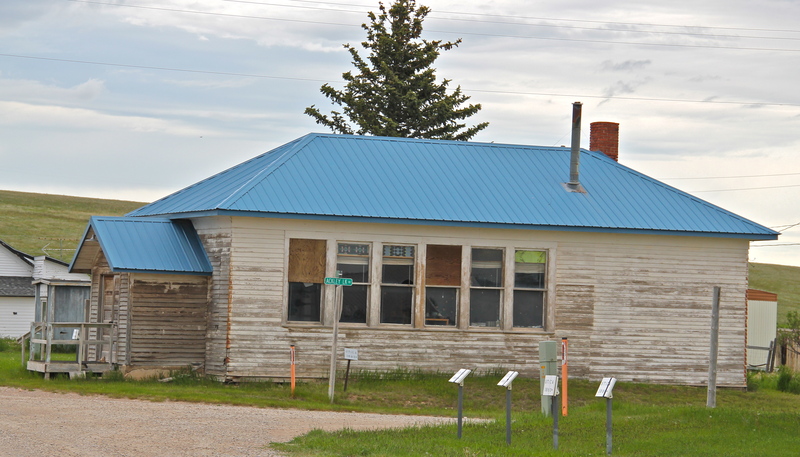 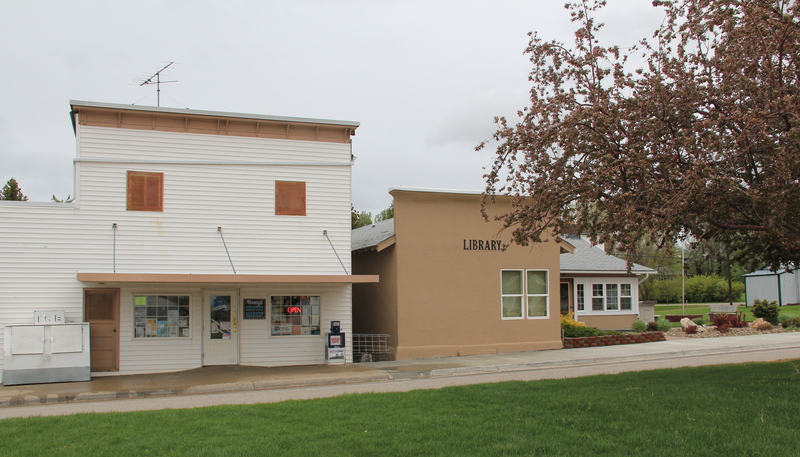 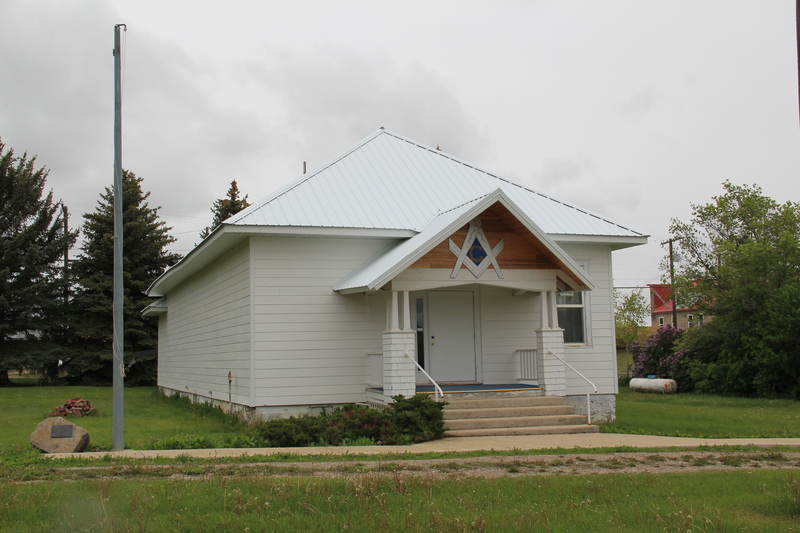 The center at Martinsdale has always been well maintained, and now that the depot is gone, it is the community landmark. 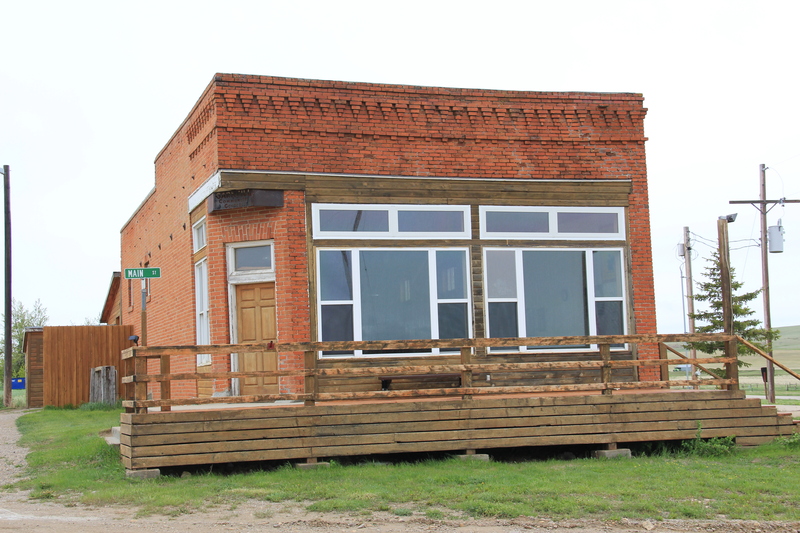 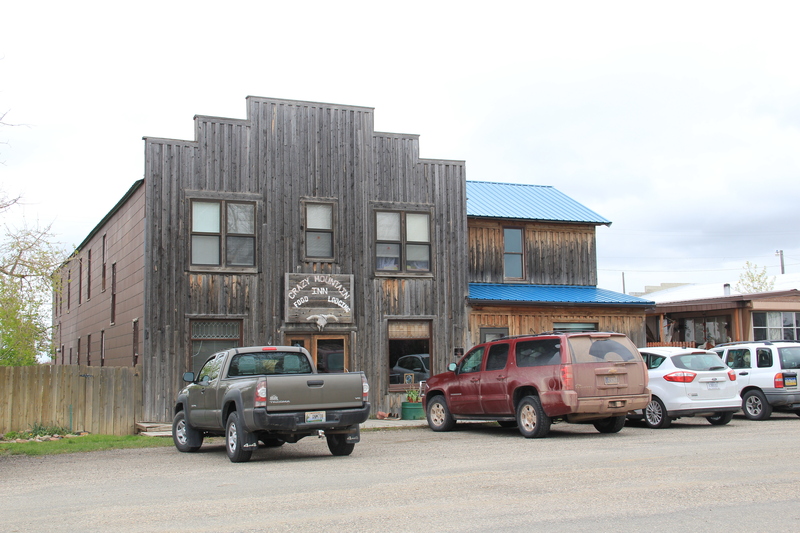 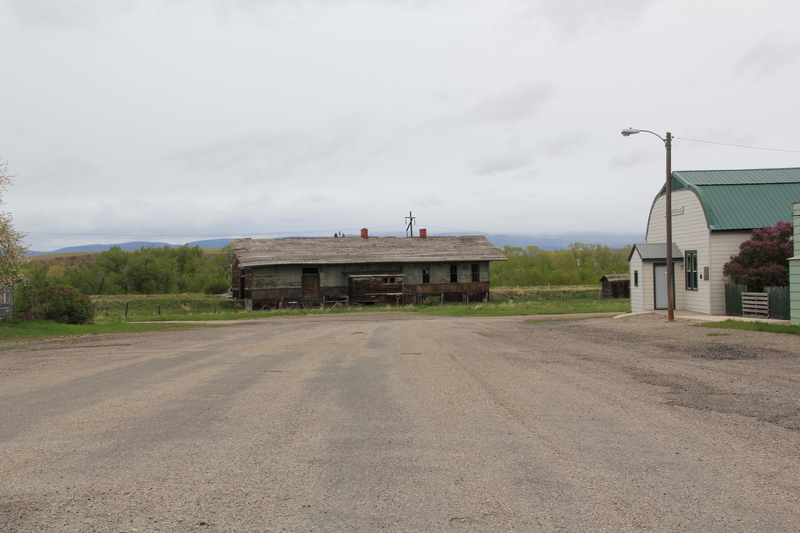 Business, however, is not booming in Martinsdale. 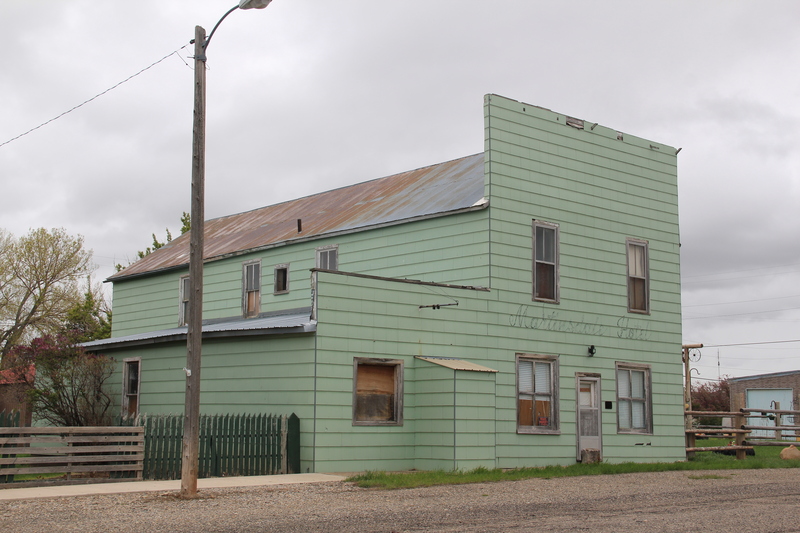 The Crazy Mountain Inn serves as the local restaurant and lodging option, the older classic false-front Martinsdale Hotel is now shuttered. 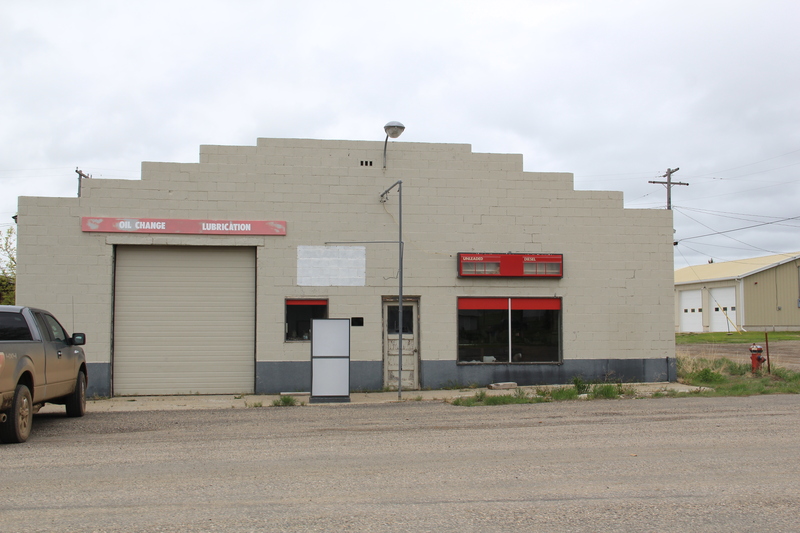 Even classic roadside institutions like the town’s two historic service stations/garages have closed–their mid-20th century designs are reminders of the days when automobiles came this way in numbers. 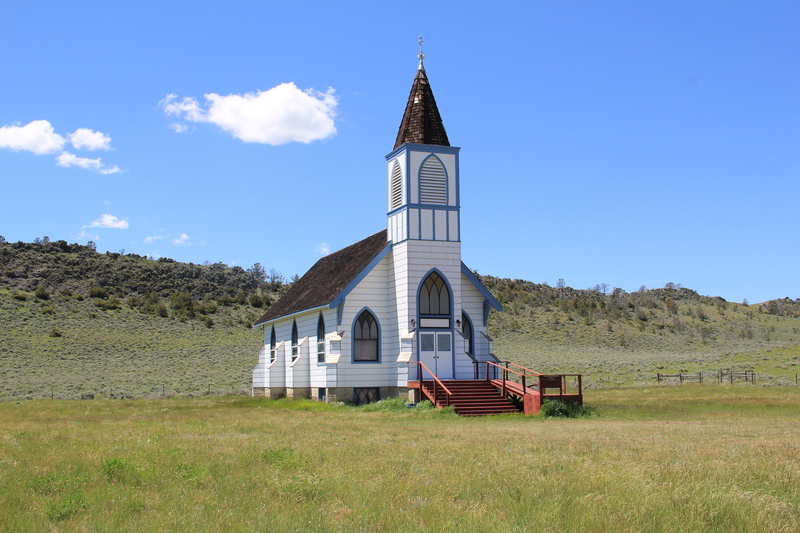 better shape in 2011 than the Martinsdale station–and the sacred landmark that dominates the view from U.S. Highway 89 for miles: St. John’s Catholic Church. 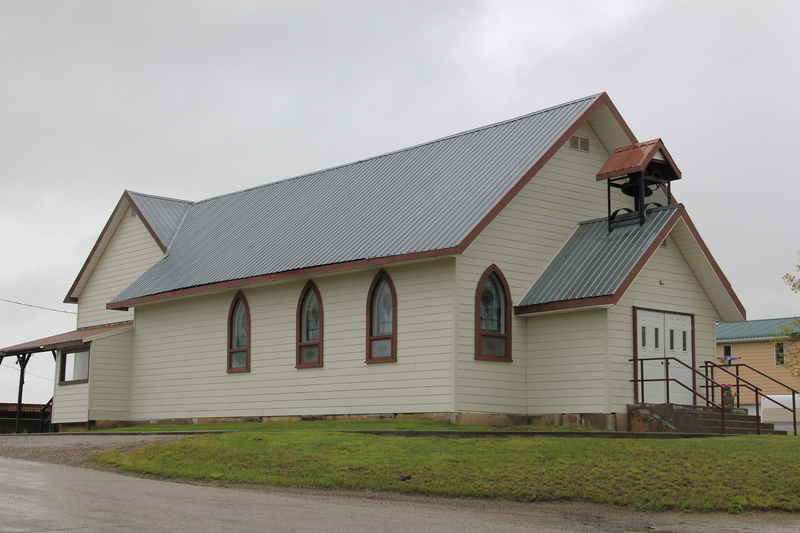 The church dates c. 1910 and is a wonderful example of Arts and Crafts style in an otherwise basic gable-front rural church building. 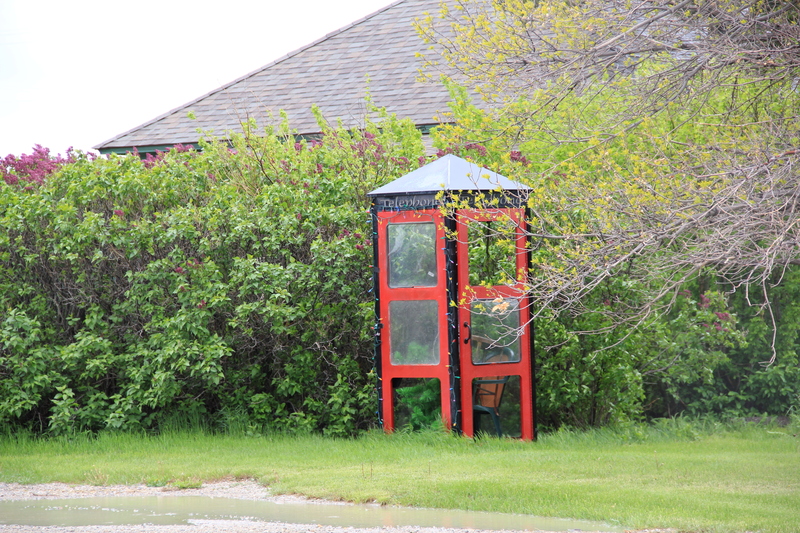 Although used much more sparingly today, it has been restored and maintained well. 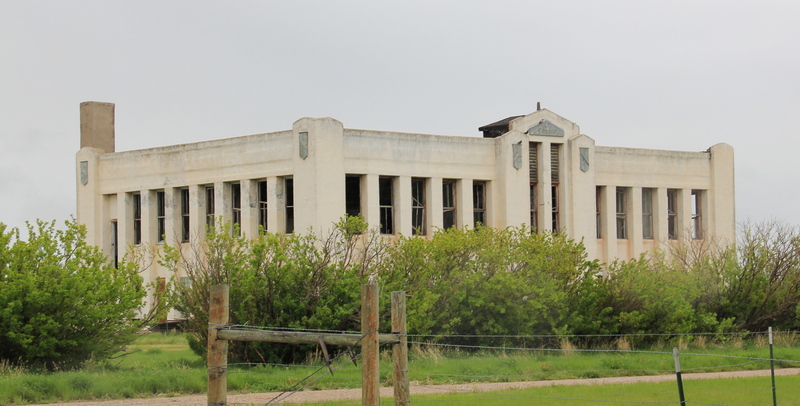 It too is eligible I would think for the National Register. 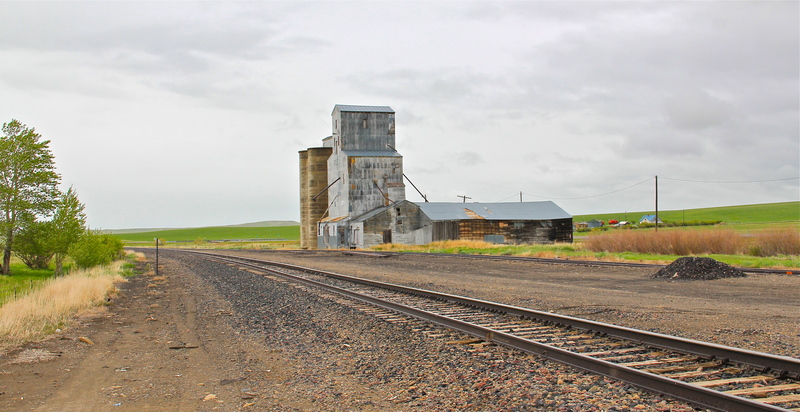 Montana 294, like the Milwaukee Road itself, is no longer a major artery–it wasn’t really in 1984 and it is even moreso in 2015. 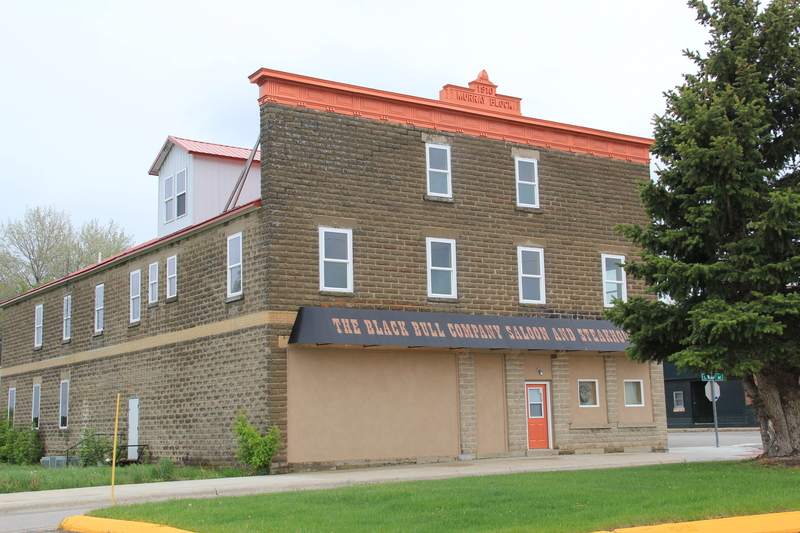 But what remains is a reminder of how the Milwaukee Road shaped the state’s landscape for 100 years, leaving in its wake landmarks of transportation, engineering, architecture, settlement, and faith.